Some refer to carnival glass as the “poor man’s Tiffany,” and with good reason. 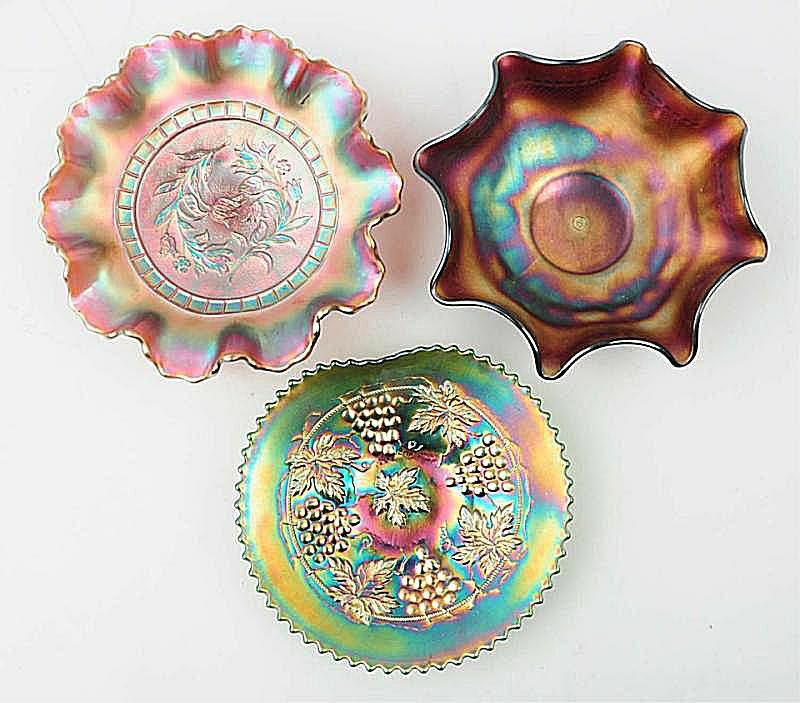 What we know as carnival glass today was made in response to the desire for early 1900s consumers to own iridescent glassware like Louis Comfort Tiffany’s “Favrile” without the hefty price tag. Dugan Glass was started by Thomas Dugan, cousin of Harry Northwood, and his partner W.G. Minnemayer in 1904. Prior to that, Thomas worked as plant manager for Northwood Glass Co. His brother, Alfred Dugan, also worked with him in the business that bore their family name. Carnival glass production continued with Alfred at the helm of the newly formed Diamond Glass Co. in 1913, while Thomas moved to Cambridge Glass Co.
“Understanding how the Northwood and Dugan families were connected helps collectors understand the linkage of these three companies. Their productions were similar; molds were swapped, retooled, etc.,” Schroy shared. Dugan and Diamond produced an array of popular carnival glass colors including amethyst, marigold and peach opalescent. They were known for both ball and spatula-shaped feet and for deeply crimped edges on pieces. One of the most prolific names in American glassware, Fenton was a family owned business operating from 1905 through 2011. They began experimenting with iridescent glass in 1907, and made carnival pieces in a variety of colors up until the 1930s. Some of the more exotic hues included red and blues known as Celeste blue and Persian blue. Some of their carnival pieces had enamel decoration as well, according to Schroy. They were also known for their finishing processes and glass detailing such as fancily scalloped and crimped edges that bring to mind ribbon candy. John W. Fenton, who founded the company with his brothers Frank Leslie Fenton and Charles H. Fenton, was also involved in carnival glass production with the short-lived Millersburg Glass Co. This Bellaire, Ohio company began producing pressed dinnerware patterns and lighting fixtures in 1904. They marketed their wares through retailers such as the familiar F.W. Woolworth and others. This company also was a glass exporter, and this included carnival glass patterns. Carnival glass made by this company includes not only table sets, but berry sets and other very usable items imitating cut glass patterns. “Colors made by Imperial include typical carnival colors such as marigold. It added interesting shades of green, known as helios, a pale ginger ale shade known as clambroth, and a brownish smoke shade,” added Schroy. Marks varied, but included the familiar "iron cross" mark. Northwood is a prominent name in carnival glass production. Harry Northwood is known for developing a carnival glass formula he named “Golden Iris” in 1908. From the Corn pattern, that really does look like an ear of corn, to other water sets, tableware and novelties, Northwood made a full line of wares with iridescent finishes in an array of colors. The pastels are particularly popular with collectors. Many pieces of Northwood are marked with the entire name spelled out in script or simply a capital N within a circle. While milk glass comes to mind most often when the name Westmoreland comes up, this Grapeville, Pennsylvania company also made its share of carnival glass. They were making iridescent glass from at least 1908 through the 1920s, in fact. Like Fenton, Westmoreland later reissued carnival glass patterns but ceased in 1996 when the factory was destroyed by fire.